The successful launch of the Asian Infrastructure Investment Bank (AIIB) and confrontations in the South China Sea have reignited the debate over how the United States should deal with a rising China. The US has not yet offered an official response to China’s “One Belt, One Road” strategy that marks an unprecedented shift in China’s economic diplomacy from a low-key approach to an ambitious China Circle. A considered response is warranted – and the new Silk Road network could offer an opportunity for the US to engage with China in a constructive manner. The initiative has two parts, namely, the Silk Road Economic Belt and the 21st Century Maritime Silk Road. The concept was introduced by Chinese President Xi Jinping in late 2013. In less than 18 months, China has produced a comprehensive action plan with committed support from nearly 60 countries in Eurasia and beyond. The proposed network has enormous geographic scale. 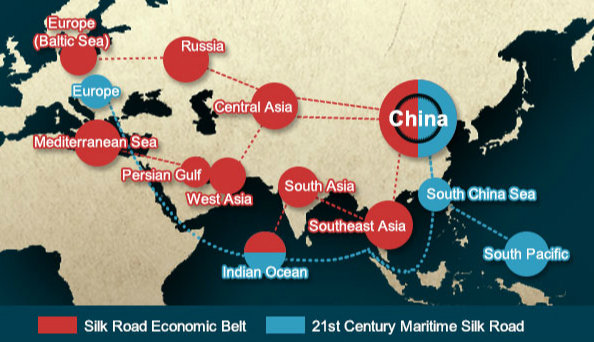 The belt on land connects China, Central Asia, Russia, and Europe in the north and links China with the Persian Gulf and the Mediterranean Sea through Central Asia and the Indian Ocean in the south. The maritime route starts from China’s coast to Europe through the South China Sea and the Indian Ocean in one route and to the South Pacific in the other – estimated to cover 4.4 billion people and US$2.1 trillion gross production, respectively 63 percent of world population and 29 percent of world GDP. China’s vision is no less impressive than the geographic scope. The belt and road will not only enhance “five connections” – trade, infrastructure, investment, capital, and people – it will create a community with “shared interests, destiny, and responsibilities.” China hopes the network will become two wings of Asia, with China at the head of this flying eagle. The China Circle is partly driven by Obama’s pivot to Asia strategy, announced in 2011 and also called a rebalance to Asia. The pivot includes two main security and economic arms – to redeploy 60 percent US air and sea power to Asia by 2020, surrounding China, and to negotiate the Trans-Pacific Partnership Agreement with allies, excluding China. The de facto containment effects of these policies prevent China from expanding its influence to the East and South. The circle opens diversified export markets for China. China’s traditional markets in the US and Western Europe, while big in scale, are sluggish. More importantly, in some sectors such as solar technologies, machinery, or telecommunication and construction services, these traditional markets are either already saturated or riddled with protectionist trade and investment measures. Developing countries along the proposed Silk Road are far from fully tapped. China’s bilateral trade with countries along the Silk Road represent 26 percent of China’s total trade in the first quarter of 2015, according to Chinese Ministry of Commerce. China will have better access to energy and food, becoming less dependent on transportation routes controlled by the US military. So far, about 80 percent of China’s oil imports go through the Strait of Malacca, which is crowded and under the control of the US military and non-Chinese commercial entities. Going through the Gwadar Deep Water Port in Pakistan will shorten by 85 percent the distance between China and Europe, the Middle East and Africa, rather than going through Malacca. Gwadar is part of the China-Pakistan Economic Corridor, for which China has signed an investment agreement of US$46 billion, about one fifth of Pakistan’s annual GDP and 10 times the amount of US investment in Pakistan, to connect the two nations by rail, road, pipelines, and optical cables. In April, China’s state Xinhua news agency reported that the nation will invest in the Thai Canal, also known as Kra Canal, cutting through southern Thailand to save up to 48 hours to shipping companies transiting routes between Asia and Europe, a route also circumventing the Strait of Malacca. The China Circle has a potential to be a renminbi circle, allowing China to optimise use of its foreign reserves and accelerate internationalisation of the currency. China has around US$4 trillion in foreign reserves; so far more than 60 percent of the foreign reserves are used to buy US government bonds. The return on these bonds is low, with China’s foreign reserves constantly losing value due to appreciation of the Chinese yuan. Instead of lending money to the US government, China is investing some reserves in infrastructure along the routes to gain better financial returns and build political friendships. Besides a couple of bilateral arrangements, China has also set up two major multilateral institutions, namely, the AIIB with US$100 billion initial equity, and the New Development Bank with US$50 billion equity proposed by BRICS countries, headquartered in Beijing and Shanghai respectively. China also established the Silk Road Fund, starting discussions about a financing mechanism for the Shanghai Cooperation Organization. As announced in its belt-road action plan, China envisages “more capital convergence and currency integration” accompanied by lessening dependence on the US dollar. The renminbi is widely used for trade in countries including Mongolia, Russia, Kazakhstan, Uzbekistan, Vietnam, and Thailand. By the end of 2014, offshore renminbi deposits amounted to ¥1.6 trillion and offshore renminbi bonds reached ¥350 billion – a trend supported by the belt-road initiative. Moreover, this initiative calls for establishing a renminbi-nominated Asian bond market. Finally, the China Circle is a manifestation of commitments to improving international governance and increasing the representation of developing countries in dealing with global affairs. The belt-road initiative may well be an exercise of more “China wisdom, China roadmap” and “more public goods for international community,” as stated by Xi during a 2014 visit to Latin America. For many countries, China’s roadmap could bring a welcome economic boost and job creation. Probably not. China’s manufacturing capacity, domestic market and foreign reserves are big enough to create its own circle. Many countries will decline to support containment measures; despite US admonitions against joining AIIB, most major economies, 57 in all, applied as founding members. Shall the US welcome China’s rise and the emerging China Circle? It’s not wise for US politicians to bury their heads in the sand. The rise of emerging countries is inevitable. The rise of the China Circle, along with an Indian Circle and Brazil Circle, is unstoppable. Obama’s State of the Union address in 2015 and recent congressional trade debates fail to offer a global vision, by arguing that US policymakers should ensure that the US, not China, write the rules of the global economy. Sadly, their worries centre solely on putting US workers and business at a disadvantage. In assuming global leadership, the United States should welcome China’s more equal-footing participation in updating rules and recognise that its growing influence may be a force for good. China’s belt and road, if successful, may be such an example, helping fill capital gaps in badly needed infrastructure, economic development, and political institutions throughout Eurasia. A more developed region could create a bigger economic pie for everyone, including US business and workers. Success could also undermine terrorism and radical movements. Will supporting China’s One Belt, One Road, compromise core universal values and high environmental and labour standards? These are key areas where the US can show leadership and remain a keystone of the 21st century global economic architecture. But a keystone must work with other stones rather than stand alone. This piece first appeared on Yale Global Online.